On Sunday July 27th, we urge you to THINK BIG. 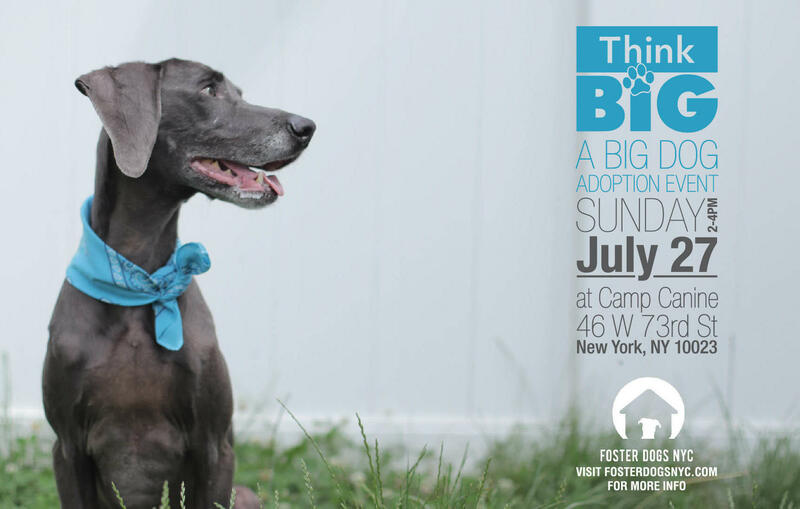 Our Big Dog Adoption Event is here, urging you to adopt a larger dog, whether you live in NYC or the suburbs. Location: Camp Canine, 46 West 73rd, Upper West Side. All adoptable dogs will go home with yummy natural dog treats from Little L's and with dog food samples from Penny Pasta Pet Food. Hosted by Camp Canine. Event photographer: Leslie Leda. Meet the adoptable dogs! Apply in advance by learning more info at each dog's link, and by contacting the dog's rescuers for an application: MELI, ACE, HEIDI, MAC, MR. BABY, LUNA, PETE, ARIEL, HOLLY, BAILEY, SIMBA, BUDDY BEAR, PAYTON, KATE BOSWORTH.